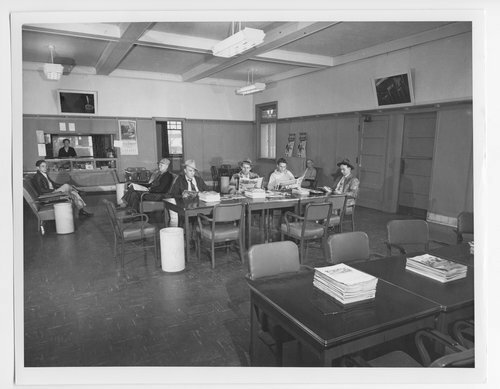 This black and white photograph shows the interior of the Atchison, Topeka & Santa Fe Railway Company's new Reading Room at Waynoka, Oklahoma. It was the former Harvey lunchroom. People gathered in the room are identified as (left to right): W. C. Smelcer, call boy; L. T. Miller (wearing cap), engineer, Wellington; J. A. Stinson, local Santa Fe agent; G. T. Snyder, utility clerk; E. E. Wood, brakeman, Wellington; J. M. Robinson, manager of the Reading Room, and H. C. Barber, National Car Loading expeditor. Mrs. L. Fry, stands behind the cigar counter.